‘The Castle at Tancarville, Normandy’, a gouache and watercolour sketch by JMW Turner (1775-1851) that sold for £22,000 at Moore Allen & Innocent in Cirencester. 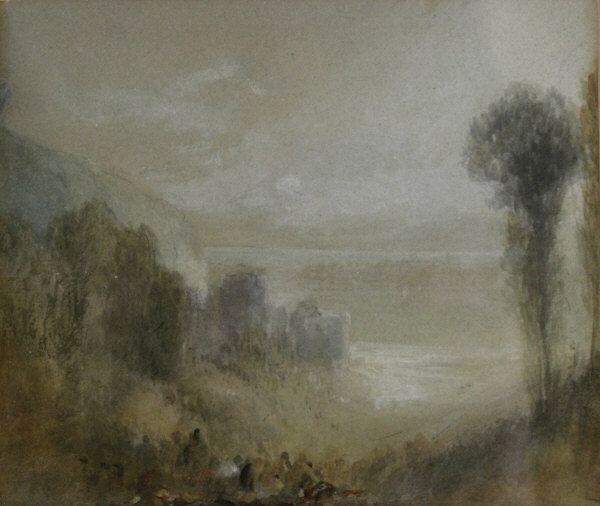 The Castle at Tancarville, Normandy is one of five known gouache and watercolour sketches made by Turner of the landscape in 1832 - others forming part of the 1856 Turner Bequest in Tate Britain. Worked on a sheet of 7 x 6in (17 x 14cm) blue paper it depicts the ruined castle on its rocky platform overlooking the Seine with a crowd providing colour and compositional interest to the foreground. The image, torn from a sketchbook, was had been trimmed and glued down on card. The JMW Turner sketch, torn from a sketchbook, had been trimmed and glued down on card. Turner toured the coast, countryside, and urban settlements of northern France in the late summer and autumn of 1832, gathering material for popular publication projects. The Tancarville drawings later formed the basis of two engraved illustrations for a two-volume account of a cruise from Le Havre to Troyes titled Turner’s Annual Tour: Wanderings by the Loire and Seine. Published by Charles Heath in 1833-35, the series reissued in 1837 under the title Rivers of France. The sketch, expected to achieve £15,000-20,000 at the auction earlier today, came from the family of Dr Humphrey Neame (1887-1968), a prominent Harley Street eye doctor. 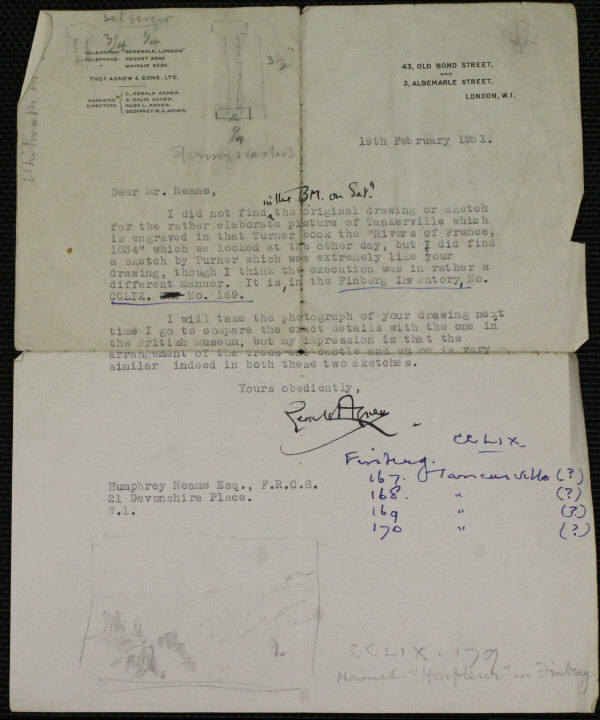 The lot was accompanied by a copy of a letter to Neame, dated February 19, 1951, from art dealer Charles Gerald Agnew (1882-1954) in which the sketch was discussed. In 1951 the sketch was the subject of a letter from art dealer Charles Gerald Agnew to the owner Dr Humphrey Neame.